Fragmentary Texts » Citation obsession? We post here a link to an interesting article by Kurt Schick (The Chronicle – October 30) on modern “citation obsession”, a problem that nowadays concerns not only scholars, but also librarians, tutors, and students. The author of the article mentions The Citation Project, which is is a multi-institution research project responding to educators’ concerns about plagiarism and the teaching of writing. The points addressed in the article and the aim of the Citation Project are very interesting and stimulating for discussing in general topics and problems raised when citing and quoting something, from ancient to modern sources. Meanwhile, the writing center stinks of fear as students struggle to decipher APA, MLA, AP, and Chicago (or is it Turabian?) documentation styles, which seem as alien and absurd to them as using a typewriter. Academic departments and even whole colleges consistently beg the library and writing center for workshops to rehabilitate their worst citation transgressors. Bibliographic citation has apparently eclipsed perfect grammar and the five-paragraph theme as the preoccupation of persnickety professors. What a colossal waste. Citation style remains the most arbitrary, formulaic, and prescriptive element of academic writing taught in American high schools and colleges. Now a sacred academic shibboleth, citation persists despite the incredibly high cost-benefit ratio of trying to teach students something they (and we should also) recognize as relatively useless to them as developing writers. Professors’ obsession with citation formatting is relatively new. Many of us over the age of 40 probably cannot remember learning much about citation styles until graduate school—not because our memories have faded, but because our teachers knew better than to demand that we fret about such specialized, scholarly formalities. It’s not that they were teaching us to be sloppy scholars, either. On the contrary, they emphasized how to effectively and responsibly locate, evaluate, and integrate other writers’ words and ideas into our own writing better, perhaps, than we teach students to do today. Surely, the uneven quality of information available online makes it more important for writers to know how to evaluate the worth of their sources than how to parse pedantic rules and display their expertise in footnoting. What I advocate here is not to dispense with teaching students how to use sources but rather to abandon our fixation on the form rather than the function of source attribution. Here’s why: We cannot control how much time and effort students invest in a particular writing assignment; we can only influence how they distribute their energies. 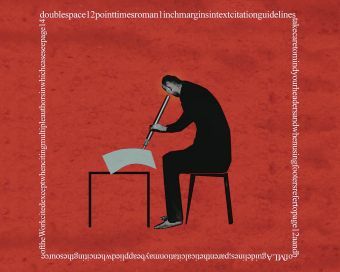 Professors’ overattention to flawless citation (or grammar) creates predictable results: Students expend a disproportionate amount of precious time and attention trying to avoid making mistakes. Soon, they also begin to associate “good” writing with mechanically following rules rather than developing good ideas. In contrast, experienced writers (like us) edit meticulously only after they have allocated substantial effort to more complex and consequential writing tasks, such as refining their topics, selecting and processing their sources, organizing their ideas, and drafting and revising their manuscripts to improve focus and coherence. Nitpicky professors hinder student writers’ development by effectively forcing them to invest more time and thinking in less important elements of writing. Recent research by the Citation Project corroborates how severely teachers’ citation psychosis has diminished students’ information-literacy skills, in particular. Rebecca Moore Howard and Sandra Jamieson blame “plagiarism hysteria,” which compels teachers to punish improper citation more than reward students’ effective use of sources’ words and ideas. Thus, clever students master quotation “mining” and sloppy paraphrasing, and they rarely summarize (or, presumably, deeply read or understand) their sources. Why should they, when success equals completing a checklist (“minimum of six sources including two books, two peer-reviewed articles … proper MLA format, including a period before the parenthetical citation for block quotations”) rather than composing writing that engages readers with sophisticated content or, heaven forbid, eloquent prose? Should we not judge writing on its content and character rather than its surface features? The intricacies and formalities of citation become useful to scholars only when they publish their work. Until then, they need a bookkeeping system to keep track of where they found things (a system that others might later use to retrace their steps), and some means of attributing their sources and thus establishing the credibility of information for their audiences. More than anything, source attribution enables students—who, by virtue of being students, don’t yet know much about a subject—to borrow knowledge and ethos from those who do. It’s just about that simple. What might be more surprising is how simple formal citation mechanics really are. Citation contents are virtually the same across styles and disciplines: author’s name(s), title(s), publication information. As anyone who’s translated a manuscript from MLA to APA and then to Chicago format knows, the only differences are sequence, punctuation, and format. Why, then, could we not simply ask students to include a list of references with the essential information? Why couldn’t we wait to infect them with citation fever until they are ready to publish (and then hand them the appropriate style guide, which is typically no more difficult to follow than instructions for programming your DVR)? We could then reinvest time wasted on formatting to teach more-important skills like selecting credible sources, recognizing bias or faulty arguments, paraphrasing and summarizing effectively, and attributing sourced information persuasively and responsibly. If anything, we should abandon trivial roadblocks so that students can write more often in more classes. Recent research demonstrates how effectively and efficiently writing can improve comprehension of content in any discipline. Writing also enables students to practice analysis, synthesis, and other skills that constitute critical, creative, and even civic thinking. If writing provides one of our best means to enhance learning outcomes across the curriculum, then more writing equals more learning. Why would we design writing assignments with obstacles that discourage students from learning? Kurt Schick teaches writing at James Madison University. sumtimes like it wild, what bout you? Who is using Clarin or Dariah to work with historical languages? Get funding for your DH project? Vitruvian design for scholarship in the humanities: Druids in Oxford? Fragmentary Texts by Monica Berti is licensed under a Creative Commons Attribution-ShareAlike 4.0 International License.